Use the form below to contact accommodation Tabacon Resort & Spa directly. 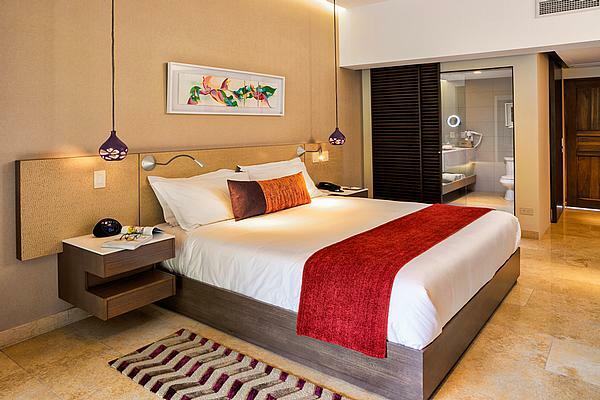 Relax in the inviting ambience of our spacious Orchid Rooms. They are furnished with colorful décor including one king bed, sofa bed and side table. The rooms are equipped with high-speed wireless Internet, Cable TV, and air conditioning system. Tropical sounds and colors of the rainforest will be part of your experience during your stay in our Orchid Rooms. Relax in the inviting ambience of our spacious Orchid Rooms. They are furnished with colorful décor including a two queen beds and side table. The rooms are equipped with high-speed wireless Internet, Cable TV, and air conditioning system. Tropical sounds and colors of the rainforest will be part of your experience during your stay in our Orchid Rooms. Our elegant and comfortable Rainforest Suite rooms seamlessly blend indoor luxury with an outdoor terrace, which includes an area overlooking the native tropical landscape. Bathroom includes a Jacuzzi and a separate glass-enclosed shower. The furniture is handmade by Costa Rican artisans. 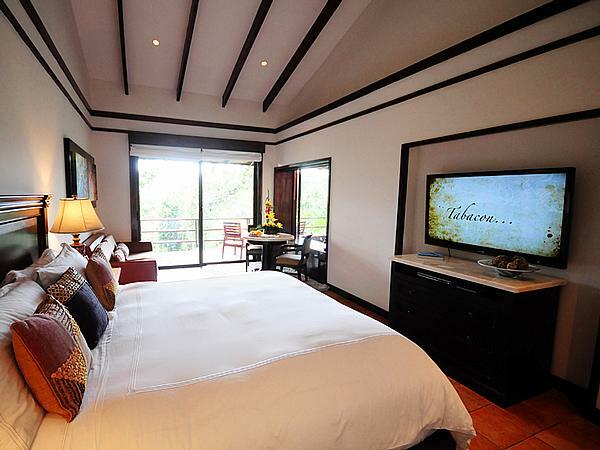 The Rainforest Suite have a king size bed with a view of the forest. For the truly discerning traveler, the exclusive Senator Suites combine extensive space, extraordinary comfort and exquisite design in one thoughtful setting. These suites are ideal for those seeking more spacious accommodations, with both a dining and living room included for an unforgettable experience. Sleeping areas include a master bedroom with a king bed and a second bedroom with two full beds. A beautiful master bathroom features an in-room Jacuzzi and separate glass-enclosed shower. A second lavatory plus a spacious walk-in closet add to the suite’s privacy and style. Complimentary coffee and tea selection and WiFi are included. Customized services are available for guests staying in these suites, which are perfect for families or friends traveling together, or for small groups wishing to connect adjoining rooms. The maximum occupancy for these suites is four people. Exotic gardens will surround you while you enjoy our Superior rooms. These rooms offer either a king size bed bed and have a view of the gardens. The furniture is handmade by Costa Rican artisans. Exotic gardens will surround you while you enjoy our Superior rooms. These rooms two queen beds and have a view of the gardens. The furniture is handmade by Costa Rican artisans. 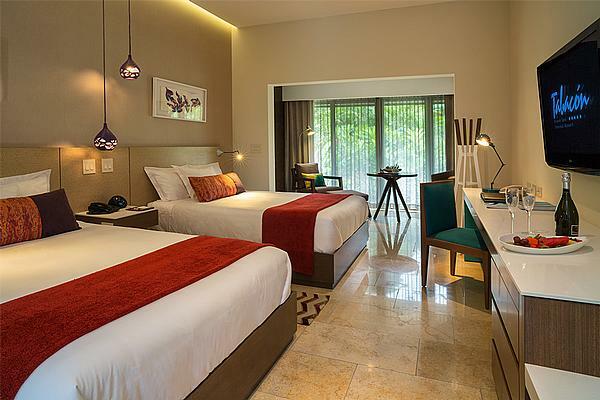 The new Tabacon Suites offer a spacious, luxurious setting and impressive views of the rainforest. 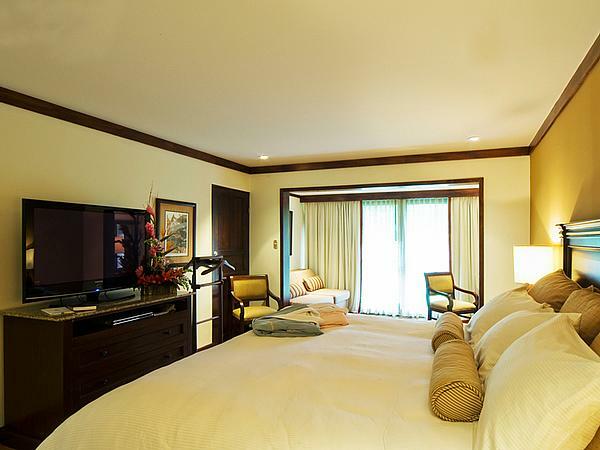 Elegantly designed for luxury and comfort, the suites includes one king bed and sofa bed for a maximum of three guests. Exclusive amenities include luxurious bath products, a separate in-room Jacuzzi and shower, 55″ Smart TV, complimentary high-speed Wi-Fi internet access, and complimentary coffee and tea selection. Escape to the infinite comfort and luxury of our Tabacon Suite two bedroom. With expansive space, supreme comfort and elevated design for complete harmony between the outdoors and the indoor setting, the Tabacon Suite two bedrooms envelop guests with views of the beautiful surrounding rainforest. These two-bedroom suites include a master bedroom with a table and resting area, a king bed, and a 55″ Smart TV; plus a second bedroom with two full beds and a 42″ flat-screen TV. Our Tabacon Suite two bedroom are appointed with luxurious bath products, an elegant bathroom with granite counters, in-room Jacuzzi and separate glass-enclosed shower; complimentary coffee and tea selection and complimentary Wi-Fi. The maximum occupancy for these suites is four people. 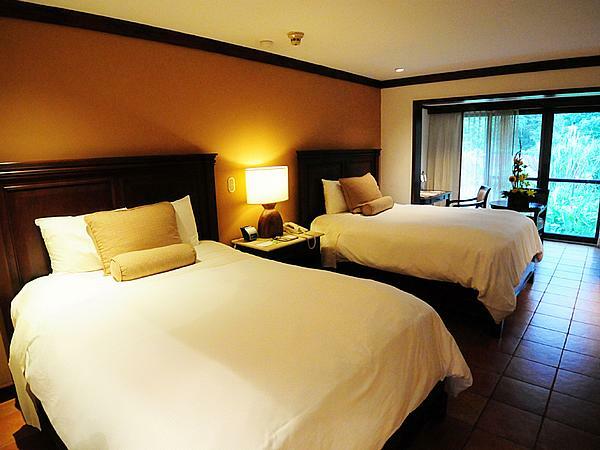 The new Tabacon Suites offer a spacious, luxurious setting and impressive views of the rainforest. Elegantly designed for luxury and comfort, the suites includes two full beds and sofa bed for a maximum of three guests. Exclusive amenities include luxurious bath products, a separate in-room Jacuzzi and shower, 55″ Smart TV, complimentary high-speed Wi-Fi internet access, and complimentary coffee and tea selection. Boasting beautifully landscaped gardens, elegantly designed hot spring fed swimming and soaking pools, and a full service eco-spa, the Tabacon Grand Spa Thermal Resort has received praise for its dedication to environmentally-friendly practices and its luxurious accommodations. A perfect combination of volume, temperature, and low mineral content, the hot springs are channelled into five pools where visitors can gaze at the stunning Arenal Volcano. Whether guests are seeking a romantic and mystical experience in the Costa Rican rainforest or families are looking to explore the natural beauty, the Tabacon offers several styles of rooms and suite to meet the needs of each guest. The Tabacon, the life work of architect and owner Jaime Mikowski, is set on 350 hectares of rainforest about 20 minutes out of La Fortuna. The thermal springs flow uninterrupted through the local rainforest and offer an opportunity to relax and rejuvenate. A top destination for weddings and honeymoons alike, the dedicated staff at Tabacon will ensure that guests are tastefully spoiled and leave with everlasting memories. Outside of this carbon-neutral resort, a variety of thrilling outdoor adventure activities are available. Take the wedding party or family white-water rafting in the Sarapiqui River, rappelling along waterfalls in a beautiful canyon, or ziplining above the treetops via one of the multiple canopy tours.